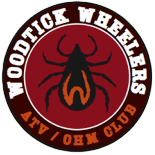 The Woodtick Wheelers ATV/OHM Club will hold its Spring Meeting & Pancake Breakfast on Saturday, May 6th, from 9 to 11 a.m, at Lewie Schrupp’s garage (same location as last year). It will be followed by a club ride in the Chippewa National Forest to Huddle’s Resort on Leech Lake. Meeting features free pancake breakfast, free trail maps and DNR reg books, trail updates, 2017 club ride schedule and new club gear. and fishing gear still in packages. Ride or trailer your ATV to the meeting. Directions from Hackensack:East on Cty 5 for 2.5 miles, left (north) on Cty 122 for 3 miles, road turns west (Stony Drive), 1 mile to 3879 Stony Drive (before the Y). Watch for signs to meeting and to trailer parking area. For more information, send email to club president Dave Halsey or vice president Andy Becker.Thanks for supporting the club! ‘Like’ us on Facebook and visit WoodtickWheelers.com. Send us your ideas, places you’d like to ride, menu items for ride lunches, and other comments!